A BBC report on alleged “anti-Semitism” on campus failed to disclose a key interviewee’s leadership role in the pro-Israel advocacy group StandWithUs. The report, broadcast twice on the 27 April episode of BBC Two’s “Victoria Derbyshire” show, also led to an online news item which similarly failed to note the Israel advocacy background of key interviewees (an omission then partially resolved, following complaints). On “Victoria Derbyshire”, the video report was breathlessly introduced as an “exclusive story” into how the Charity Commission is “investigating” student unions over their support for the Palestinian-led Boycott, Divestment and Sanctions (BDS) campaign. The show’s Twitter account was even more direct, tweeting: “EXCLUSIVE: Seventeen students’ unions are being investigated over anti-Israel campaigns.” The tweet was later deleted however the Facebook post has remained, please see the “edit history” for the post to see the changes made to it. In fact, no formal investigation has been opened by the commission into any of the student unions mentioned by the BBC, as confirmed to me yesterday by a spokesperson over the phone. The BBC report quickly spawned further, inaccurate coverage, forcing the Charity Commission to issue a clarifying statement. “Concerns have been raised with us about a number of student union charities – we have assessed those concerns in line with our usual processes,” said a spokesperson. We do not, at this time, have a statutory inquiry open into any student union charity. As a result, articles in both the Telegraph and Jewish Chronicle were first edited, then completely replaced (the original headlines are preserved in the URLs). Note that while some are now reporting that the Charity Commission is “warning” student unions, there is nothing to substantiate that interpretation in the aforementioned spokesperson’s statement. a student union is perfectly entitled to endorse ‘a motion relating to the BDS movement’, as long as the union is ‘clear what this means in practice’ and can ‘explain how doing so furthers the charity’s purposes and therefore is consistent with their legal duties’. In other words, UK student unions have a legal right to campaign on issues that impact students, including the investments and contracts held by universities with institutions and companies that support, or are complicit in, Israeli violations of international law. Because the BDS movement is asking universities to change their university policy, it is a student issue. As the commission told the BBC, “campaigning and political activity can be legitimate and valuable activities for charities to take part in”, provided they are “undertaken in the context of supporting the delivery of a charity’s purposes.” But this crucial point of law was not mentioned once in the BBC’s coverage, either in the TV report or online. The BBC’s misleading reporting regarding the position of the Charity Commission was compounded by its handling of interviewees, both in the pre-prepared video report and in the studio. The video report’s two main interviewees – whose views went entirely unchallenged by BBC journalist Jon Ironmonger – did not have their roles in Israel advocacy highlighted, despite the obvious relevance of such information for the viewer. Devora Khafi, a student at Queen Mary University in London, was interviewed at length and her claims were central to the piece – but her role as national “Campus Director” for the UK branch of a well-known Israel advocacy organisation, StandWithUs, was entirely omitted. StandWithUs is an organisation which devotes a significant part of its resources to fighting BDS and the Palestine solidarity movement in general, and has even received funding from the Israeli government in support of its efforts to defend Israel’s violations of international law. 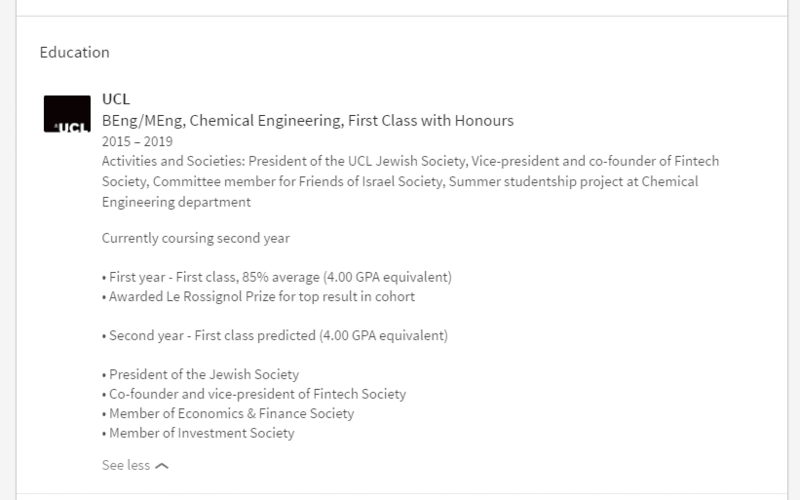 Another interviewee, Isaac Bentata, is a “committee member” of the UCL Friends of Israel Society, but his role in a pro-Israel organisation was not acknowledged [Bentata has since deleted reference to his role in the Friends of Israel Society but a screenshot of the original can be seen here]. David Hirsh, meanwhile, appears as a “Lecturer at Goldsmiths” – but his long-standing anti-BDS activism went unmentioned. By contrast, the only individual to give a dissenting opinion in the report, SOAS PhD student and BDS supporter Sai Englert, was specifically referred to as a member of his university’s Palestine Society. That bizarre but instructive remark served as a microcosm for the whole affair: an attack on the BDS campaign and its supporters without actually addressing Israel’s decades-old policies of colonialism, apartheid and occupation. As BDS-supporting academic Jonathan Rosenhead noted in the BBC studio, it’s “the elephant in the room that you don’t want…to talk about”.